Diesel engine inventor is Rudolf Diesel, he was born in Paris, France in 1858, dated March 18, died September 30, 1913, at the age of 55 years, mysteriously dies, falls and sank in the English strait. Until now not known for sure why he fell there, Rudolf Diesel's parents are German who emigrated to France. Diesel's childhood was spent in France until the Franco-Prussian war broke out in 1870. They all fled to London, England. Diesel's father did not succeed in getting permission to settle in France, at that time there was a policy for emigrants in France. When Diesel was 12 years old, at the end of the war, the mother sent him to Augsburg to live with his uncle and aunt, to study speak German, and study in Royal County Trade School (Gewerbsshule), where the uncle became a teacher of mathematics. Shortly after that, the German-French war broke out. The full name of the inventor of this diesel engine is Rudolf Christian Karl Diesel. His family is a leather craftsman since he was a little-known genius. At the age of 20 years (1870), he received a bronze medal from Société Pour L'Instruction Elémentaire. For some of his brilliant scientific works. At the age of 14, Diesel sent a letter to his parents, telling of his dream of becoming an Engineer. Her basic education went through brilliantly, becoming the best student in her class, completed in 1873. Then she continued her education at the School of Augsburg. In 1875 he received a scholarship from Royal Bavarian Polytechnic in Munich, at that time Diesel forced to oppose his parents, for Rudolf Diesel to start working because his parents were in financial trouble. While studying, Rudolf Diesel works in a factory. In 1870 Rudolf became known and recognized as a Reliable Mechanic. In 1880 he graduated from his university, honored as a student with the best grades, should have taken his graduate examination in 1879, but at that time he was dengue fever. After recovering from his illness he worked as a mechanic in Sulzer, Winterthour, while developing an ice machine. During college in Munich (Munich) he carved out many achievements. Among other things with his professors, he succeeded in compiling a blueprint of the steam engine, with the highest efficiency at that time. Writing published papers for the public. After graduating from his university in 1880, he went to Paris to establish a branch company there, an ice machine company. He is willing to work unpaid. But the 1881 company appointed him to become a Director of the plant in Paris. That year he met for the first time with Heinrich Buz, Augsburger machinery director. They make deals on making and testing, developing a transparent ice-making machine system. That same year Rudolf received his first patent certificate upon his invention of producing claret in a bottle. Rudolf began building a large ice factory in Paris in 1883. The ammonia machine development plan was started, a year later. In 1886 1886 he expanded his factory in Belgium. And the idea of ​​an ammonia absorbent machine for medium-sized enterprises is realized. It was then that Rudolf Diesel proved the theory of electromagnetic waves at high speeds per second. In 1889, Rudolf showcased his ice and cooling machine at a technical show in Paris. Then gave a public lecture at an international congress, about an applied machine. He received a festive reception and a company in Berlin, Lindes immediately offered him a contract of employment, in 1890. Then Rudolf Diesel conducted research on the use of fuel on one machine to be more efficient. The steam engine in his era only has an efficiency of 10% -15%. He then designed a machine with fuel sprayed into the compression chamber and would burn from the heat generated by the compressive power. The machine that we currently know the name of Diesel Engine. The engine was created in the last decade of the 19th century. The dream to create a machine with high efficiency is achieved, because the fuel of diesel engines is the rest of the gasoline fuel filtering. Rudolf Diesel received a patent on his Diesel Engines 23 February 1893, numbered 608845. He built the prototype machine in 1897 while working in Augsburg, at MAN Factory. Named Diesel Engines, in honor of it's his invention, originally renamed "Engine Oil". which was created on August 10, 1893. That is the first Diesel Engine in the world. In 1893 it also published his book entitled: "Theory and Construction of A Rational Heat Engine for Substitution of the Steam Engines and that Today Admitted Combustion Engines". Published by Springer, Berlin. And immediately Rudolf signed a contract with Augusburger, Krupp, and Sulzer. While publishing the next book: "Nachtraege for the Theory of the Diesel Engine". The early prototype of the diesel engine was exhibited at the Chicago Fair in the United States and received a pretty good reception. In 1895, the patent commission passed that his machine was working well. In 1896, Rudolf moved to Munich. Until the beginning of 1897, he completed his advanced machine plan with a 4-step system (4 strokes). Company Deutz AG tried to match it. 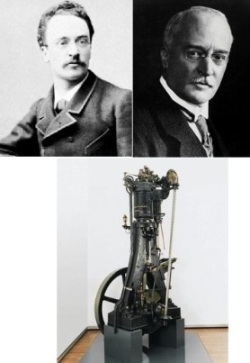 The Krupp company endorsed Rudolf, and in the end gave birth to an agreement between Deutz, Krupp and Augsburger, helping Rudolf complete the final series, refining his invention engine. That year was a busy year for him. Rudolf traveled to Scotland, Paris, to make an airplane. Signed a contract with Adolphus-shrubs. Demonstrated his example engine in public in Augsburg. Gave a lecture in Kassel, inaugurated the Diesel engine society association in Paris. Facing a lawsuit over his patent by Emil Captaine. But the Diesel engine plant in Augsburg was finally built in 1898. Examples of early engines were exhibited at the Munich fair. Successfully complete the first diesel engine with a compressor for the Deutz AG company. The disaster came again, he entered a mental hospital in Neuwittelsbach, Muenchen. But the first diesel engine plant built in America finished that year as well (1898). Disaster came again, in 1899, diesel engine plant in Augsburg closed because it failed to achieve the target production amount. But that year also the Diesel engine used in oil drilling field for the first time, in Gailizen. He gets sick more and more often. In 1900, the first Diesel engine plant in London, inaugurated. Rudolf Diesel is getting sick more often, because of his hard work. As he became sick more and more, he was moved to a more freshly populated settlement, in Muenchen, in 1901. During his period of illness, he wrote and published new books that were more philosophical, rather than technical, the book "Solidarismus: natürliche wirtschaftliche Erlösung der Menschen", published in 1903. In the book, his view is clear as a genius engineer who is also very concerned about issues of social and environmental issues. In 1905, diesel engines began to be used in the train. The pinnacle of his performance as he performed at the Parisian highway, with his design Diesel engine, using the peanut oil and marijuana oil. In 1912, when he received his newly created patent machine, the world recorded his most historic statement, about the future of Diesel engines that would be run on biofuel oil, now known as BIOdiesel. "Der Gebrauch von Pflanzenöl als Krafstoff mag heute unbedeuntend sein. Aber derartige Produkte können im Laufe der Zeit obenso wichtig werden wie Petroleum und diese Kohle-Teer-Produkte von heute. (The use of vegetable oil as a fuel for the present seems insignificant, but in time it will become important, as is petroleum and coal-tire products now). And Biodiesel engine was refined again by Ludwig Elsbett. Until finally he was found dead in the British strait in 1913, he fell and mysteriously drowned, and until now it is unknown why until he fell there. A great man who suffered a tragic fate at the end of his life. Hopefully, this diesel engine inventor article can add to your insight.